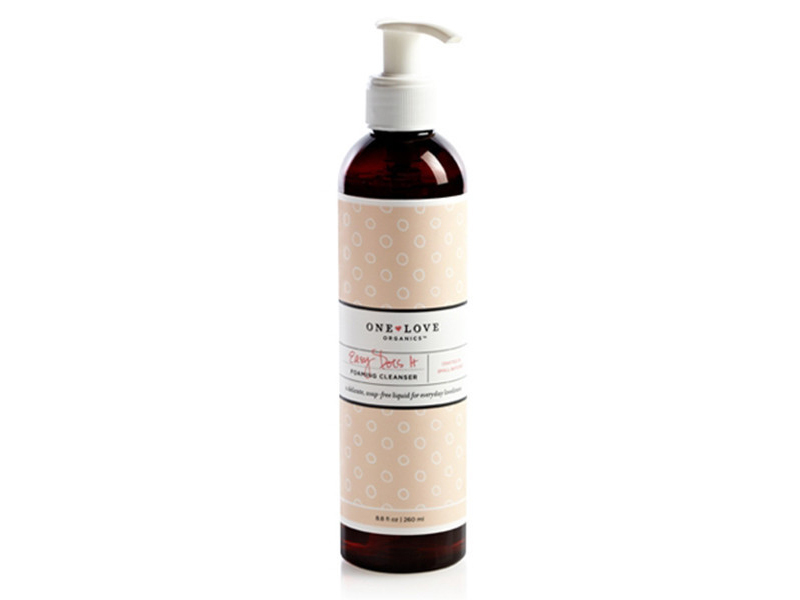 I love a good multitasking product, and I’ve found one in the One Love Organics Easy Does It Foaming Cleanser. This gentle cleanser came into my life right as I ran out of my last bar soap. Apart from Dr. Bronners, it’s been a long time since I tried anything along the lines of a liquid body wash. The Easy Does It Foaming Cleanser hit me instantly with a wave of nostalgia. Something about it reminds me of Johnson’s Baby Shampoo in the best way possible. Maybe it’s the honey color of the product or the soft apple scent, but rest assured that the ingredients in Easy Does It are actually good for you. It makes the best body cleanser. As mentioned, this cleanses well without drying out the skin. A little bit goes a long way, and it’s nice that the bottle has a pump for easy use in the shower. My skin feels soft and clean after each use, and shaving is a breeze with this cleanser. I can’t get enough of that sweet apple scent. It’s not fake or cloying, just soft and light. You can shampoo your hair with it. Yes, you can absolutely wash your hair with the Easy Does It Foaming Cleanser. It thoroughly cleans my tresses without leaving my hair feeling too dry or too oily. In my never-ending experiments with products, I’ve tried to wash my hair using cleansers like Dr. Bronners or Acure in the past. It never works. I was a little skeptical when I read you could use the Easy Does It as a shampoo, but it does the job well. Try it! It would be perfect especially for kids shampoo. Meet your new favorite makeup brush cleanser. Do you clean your makeup brushes regularly? You should! It helps ensure you’re not spreading yucky bacteria among your products or your face, and it makes application so much easier when there isn’t product buildup on your brushes. A little pump of Easy Does It loosens up all the accumulated oils, colors and gunk from makeup brushes. Plus it’s gentle on them. See what I mean about this being a true multipurpose product? I recommend picking up a bottle of Easy Does It to use, at the very least, as a makeup brush cleanser. Then give it a try in the shower and put all those other products aside for the day. You’ll love how simple your shower routine can be with the Easy Does It.